1. Approval of minutes: January (m/s/p). 2. Treasurer’s Report – Karen distributed current financials showing expenditures for 2019 to date versus budget. 3. John and Peter then reported the activity surrounding the potential purchase of the property adjacent to Terry Pettus Park, and the opportunity to expand the park. The board discussed the opportunity, concluding that FHA should join other groups to support this effort. Peter agreed to work on a statement in support based on the draft he had previously circulated. 4. The board then discussed the location for the annual meeting. Susan and Tom reported their visits to different sites. The board concluded that the Swedish Club would be a good location and agreed that since the club was booked for April 17, the date discussed at the last meeting, that it would be okay to move the meeting to the 18th. Tom agreed to check the cost of renting the space, to confirm it was not too expensive. 5. John reported that Jann had sent him a mail noting that the office needed some cleaning. John reported that he planned to visit the office over the weekend and assess what cleanup might be necessary. 6. Joan reported that she had been in touch with Harbor Patrol, and they were interested in attending a board meeting. The board agreed to invite them to attend the April 3 board meeting, as well as the annual meeting. Susan agreed to host the next board meeting on April 3. Meeting adjourned at approximately 8:20 p.m.
3. Update on Fairview Avenue North Bridge Replacement Project – introductions all around. Wren McNally is on the outreach team, responsible for external communication and weekly construction updates. MariLyn is the project manager for SDOT. A slide set was handed out (and put on line). There are two bridges in this location, one timber and one concrete. The timber one needs replacement badly, and it will be more cost-effective to replace both at same time. Construction will begin spring 2019, with full construction expected to last 19 months. The existing bridge will be closed during construction in order to limit the night work. The new bridge will be wider (8-10 feet) to accommodate a two-lane bike paths and a new lane for walkers. There will no longer be stairs at the south end of the bridge; stairs will remain at the north end. There will be three viewing areas (belvederes) on the bridge. The kayak launch will stay. During construction, a 2-foot sand layer will be added to keep sediments in place and turbidity curtains will be added to contain the construction zone debris from contaminating the nearby water. (There is some existing contamination from old steam and electrical plants nearby.) The new bridge foundation will be built with drilled shafts. The traffic detour will probably start at least three months from now. Efforts will be made to limit Aloha to local traffic and others will be asked to find a new route to upper Fairview. The floating walkway will be gone during the construction so foot traffic (including runners) will need to go on Aloha. Interested homeowners are encouraged to sign up for project updates, and these will continue to be provided through the FHA. 4. Amalia (FHA lawyer) will leave to take a job as Deputy Supervisor for Aquatics and Geology for DNR. She will be in charge of all of our DNR leases so she will have to recuse herself from work on FHA leases. She can continue to consult with us but can no longer represent us. 5. Board membership: we currently have 7 representatives on Eastlake, 5 on Portage Bay, and only 2 from Westlake. We would like at least one more from the Westlake/Northlake area. One officer seat (for VP) is still open; this is the person in charge of Board recruitment. 7. Harbor Patrol – They were around a lot in small boats this past summer, and told Tom they had been funded for this extra activity by the Department of Fish and Wildlife? This summer there will be a new park on Portage Bay with sand beach, which will probably be an attractive nuisance. This led to a discussion about our needing more contact with HP, so Joan will invite Sergeant Yamamoto to one of our meetings. 8. Kenmore Air issues. Still no known evaluation of last summer’s experimental row of landing lights. Meeting adjourned at approximately 9:15 p.m.
Lake Union Ferry (LUF) – Proposal for a commuter serviceto connect SLU to Fremont and the University. (A website will be up in a couple of months.) It’s modeled after a ferry service on the small False Creek, a saltwater river in Vancouver. Recently got a permit from State Transportation, and are now working on terminal and boat design. Unlike Vancouver, all the boats here will be electric. There will be two routes: from SLU to Fremont and Portage Bay, with 3 boats on each route. Each boat will fit 30 people and 10 bikes. Each trip will take about 10-11 mins. $5 each way/trip. Wheelchair access. 3138 Fairview East– Proposal to build a 5-story building on Fairview. It’s not in the mandate of FHA to get involved in such projects. Fire sprinklers – See last month’s minutes. FHA is looking to start a dialog with Seattle Fire Dept. City Light – City Light will meet with Peter Erickson and Justin Geary (QA electric) regarding proposed changes to electrical code. Next meeting January 2 at Peter Erickson’s house. Meeting adjourned at approximately 8:40 p.m.
2. DNR Status: Amalia and John have been reviewing the actual language in the DNR lease template. b) The template is drafted for all varieties of floating structures, from the traditional houses on floats to house barges to former vessels that have been retrofitted to serve primarily as a residence. (Some of the shallow water rules don’t apply to FH; because all the DNR territory is in deep water, most of the rules apply only to the outer homes on docks, maybe the deepest 10-15 homes.) There may be clauses that do not apply to one type of structure, but may be included for a different type of structure. Their applicability will be determined on a case-by-case basis in discussion with the land manager during the individual lease negotiations. 3.Tour – The tour was very successful. Kudos to Tom Campbell & Team on such a well-run event. 4. Docktoberfest – confirmed for October 18, 6-9 PM at the Center for Wooden Boats. Oompah music is secured; still need a food arrangement. 6. The Puget Soundkeeper annual fundraise dinner is Sat., October 27 from 5:30-9:30PM (115 Bell St.). 7. The Virginia V is still coming too close to floating homes. Courtney is going to a meeting to address this issue. 8.The issue of noise from the Islander and other tour boats that come back to Lake Union late at night was discussed. Next meeting November 7 at John Leness’ house: 2031 Fairview #I. Be careful on the stairs. Meeting adjourned at approximately 9 p.m.
Meeting called to order at approximately 7:06 p.m.
Approval of minutes: July (m/s/p). Treasurer’s Report: Karen Mooney passed out a report that shows that we have money and all bills are paid through today. Insurance for Tour: Hard copies will be sent to Tom Campbell. Cost = $350. Seaplanes: When they originally cut the grand zoning bargain, Kenmore sneaked in a provision at the end to say that City Council could control the number of flights. Seattle’s Office of Economic Development got the city council and the mayor on board. Steady Floats: There is an outfit building house barges. With some kind of loophole, if they de-commission the engines, they can become FLOWRs (Floating On Water Residences). Courtney called the builder (Daniel Lostrom) out on his claim that “you’d be crazy to build on logs.” He has asked to be part of this group and we have said no. John asked if there is a way to go to the MLS and have a convention regarding the differences between a floating home and a FLOWR structure. Courtney says that she’s tried a few times but they haven’t changed it. She draws the line at when they do not have a slip. Mayor’s Visit: Peter thinks that if we schedule it far enough in advance (November meeting) and schedule it for the end of their day, we have the best shot at getting our issues addressed. No Wake/Safety Committee/Virginia V: Karen noticed that the issue is worse recently with ski boats (wake boarders) – she talked with Harbor Patrol and they basically told her that they do not ticket. Janet mentioned that Harbor Patrol asked whether the FHA is affiliated with the No Wake guy. Commercial water rates: Sarah asked if we ever got an answer. Amalia got back a partial but not full answer. Minimum width between floating homes: 6 feet float to float and 10 feet wall to wall. DCI’s jurisdiction. Rentals (including short-term rentals): if you are zoned commercial, you can do it (like some docks under the university dock). If you are a coop organization, then it should be written into the by-laws for the dock. Peter’s dock has debated this and decided: one month minimum and only once a year. Tom Campbell had great news: tickets are almost sold out; Alki gets 54. Jules mailed out the tix. 600 will-call tickets will be set up in the parking lot across the street from the 2019 dock; there will be parking there. Volunteer numbers: Sharon reported that she has potentially 22 super-volunteers that will work the whole shift. She has 75 regular volunteers that are also doing a shift. Ten owners of 8 homes will be present. There has been lots of churn among the volunteers (cancellations, changes). Houses will be open at 10 for the super-volunteers. Setting up in the parking lot will start from the south and go up; should be up to Mallard Cove by 10 to 10:15. Will-call will open at 11:15-11:30. Blair showed off the new things for sale at the Houseboatique. Blair pretty much has the cottage organized. Tom will do the exterior clean-up sometime before the tour. Sharon mentioned that there is no ramp for the featured home; John has a neighbor Jack Quick who can build a temporary ramp that can go into the house that doesn’t involve putting screws in anything. Tickets: Courtney passed out tickets to the board members. Meeting adjourned at approximately 8:52 p.m. Next meeting on Wednesday, October 3 at Sarah Morlidge’s. Approval of minutes: May (m/s/p); June (m/s/p). Treasurer’s Report: Karen Mooney passed out the report. Budget is holding steady. Karen will make sure we’re covered by insurance for the tour, but wants to make sure the coverage is adequate. UW Dock Update: The university has said to the university dock residents that the university wants the houses for visiting faculty.Susan Susor reported that the UW says the dock is zoned as commercial, not sfh (water-dependent floating home). Karen Mooney discussed PR, which her firm specializes in (social good only). Tour Updates: Tom Campbell led a general discussion of details of upcoming tour (Sunday, September 9 from noon to 5), including ticket sales, photography, sponsors, and volunteers. Seattle Night Out = August 7. Tom Campbell mentioned that the FHA will sponsor free keg of beer again for participating docks. Janet Williams said that her dock organized a party for the first time last year, and Harbor Patrol attended. Float plane issues: up to 30K flights/year. Brigitte Erickson (Peter’s spouse) is on the committee. Meeting adjourned at approximately 8:35 p.m. Next meeting on Wednesday, August 8 at Tom’s dock (Willow Cove). Next Board Meeting is September 5 @ Blair’s; resume meeting first week of each month. Meeting called to order at approximately 7:20 p.m.
1. Approval of minutes: John Leness will send May minutes to Maggie Chon, and both May and June minutes will be approved at July board meeting. 2. Treasurer’s Report: John printed out Karen Mooney’s report (sent by e-mail earlier to the board) and noted that she also provided a copy of the bank statement for internal controls. John reported that the meeting went well. The calculation of rents is complex and governed by statute. In general, there is a huge jump every 4th year (all other years are tagged to CPI, and therefore no large jumps). DNR had a great slide deck, which Sarah Morlidge will send around by eAlert. About 10-15 people attended the meeting. a. Seattle Night Out is on Tuesday, August 7. Tom Campbell announced that the FHA will again support local floating home nights out, including beer kegs. b. Sarah Morlidge to send out notices of same. The bulk of the meeting was devoted to an update on the tour planning, including the confirmed houses, photographs, theme, deadlines, and volunteers. a. Ducks: John reports that it currently looks like it is going forward. b. Ferry: John also reported that the Hayu may get dock rights in S. Lake Union. c. Harbor Patrol: boats are going faster this year. Call them if there are issues with wake; they will take care of it. Meeting adjourned at approximately 8:09 p.m.
Next meeting on Wednesday, July 11 at Peter Erickson’s house (2025 Fairview Ave., # I). Meeting called to order at approximately 7:05 p.m.
1. Welcome. John Leness thanked everyone for helping at Annual Meeting and distributed the meeting agenda. Karen Mooney distributed financial statements. 4. Treasurer’s Report. Karen Mooney reported that the bank signatories had been updated earlier that day. She reported that the financial were now loaded onto Quickbooks and much of the bill payments were now online. In light of that, she circulated the most recent bank statements for the board to review. 5. City Light Update. Peter Erickson reported that he was scheduled to meet again with City Light in two weeks to try to reduce the cost associated with their proposed electrical upgrades. they were receiving water bills at commercial rates. SPU has acknowledged that the rates are set by city code and that there is a specific rate for houseboats in the code, which they deem commercial. We need to look at rates being charged to confirm that, even if called commercial, they are the proper rates. 7. Ducks Update. John Leness and Blair Robbins reported that, in connection with the Ducks’ request for an extension of their permit, DCI has suggested that the Ducks now need to conform with the updated stormwater code and include a station to wash the Ducks undercarriage before they enter the lake. We are watching this development, as it adds a significant cost for the Duck project. 8. Tour Update. John thanked Tom Campbell for distributing the tour committee minutes. Tom updated the status, reporting, among other things, that we still need more houses. The board discussed offering tour tickets to city council. 9. University Dock. The Board discussed supporting the residents of the University Dock in their negotiation with the University of Washington, concluding that FHA should support the residents. The Board discussed at length the benefits that a public relations firm could provide. 10. DNR Update. John reported that Amalia Walton had gotten the final language to DNR, and he was working with her to get the next meetings with DNR scheduled, as discussed at the annual meeting. 11. Lake Union Runway Update. John reported that the current plan was for a single line of buoys to be installed around Memorial Day and be left in during the summer as a test. The Board discussed means of getting comments and feedback on the buoys. 12. June Meetings. The tour committee is planning to meet on June 6 for an hour, before the regular meeting. John may not be back in Seattle in time for the June 6 meeting. Meeting called to order at approximately 7:07 p.m.
2. Treasurer’s Report: Tom Hesselbrock distributed the monthly financial report for the last time as Treasurer. In two weeks (after the Annual General Meeting vote), we’ll be transitioning to Karen Mooney as FHA Treasurer. a. Vote for new board members and officers. b. Quick pitch for tour volunteers at the outset with sign-up (led by Tom Campbell, chair of community outreach and events.). c. Brief communications pitch (led by Sarah Morlidge, chair of communications). bring Tara Wilson and other land managers with him, so people can meet them face to face. Sharon Morken is the tour volunteer coordinator. Aiming for 12 houses total on Eastlake. Hours of the tour = 12-5 p.m. The FHA Office will be open. Susan Susor is shooting for $15K in sponsorships. a. Environmental: Dave Chappelle (chair, environmental) raised the issue of billing on the water/sewer bill. Q: Should docks be charged at a commercial rate or residential rate? The question is whether all the docks are getting a charge increase, or just some. The board decided to ask around informally. b. City Light: Peter Erickson (member, legislative) reported that City Light talked to someone at City Council, who felt that the floating home community did not qualify for the subsidized loan. The City charter limits loan period to ten years. c. Portage Bay Park: Construction is starting this year and will be done by 2019. The City will be having a naming contest. d. The Ducks: Blair Robbins is still keeping an eye on the construction of the new ramp. 6. Goodbyes: Dave Chappelle stated that he and Tom Hesselbrock entered at a very different time five years ago; the board has made considerable progress since then, despite initial fears about term limits. Next meeting on Wednesday, May 2 at Karen Mooney’s house. Meeting called to order at approximately 7:02 p.m.
Introduction of new board embers: Karen Mooney and Sharon Morken were in attendance. Butch Smith and Joan Rosenstock not present. Sue Jostrom reported that she is still looking for one additional board member, preferably from Eastlake. show at the Annual Meeting. This included details on the proposed leasing application process. He also plans to schedule follow-up meetings after the AGM. discussed the issues with Westlake, which is the construction work on the Aurora Bridge this summer; the work will take 2 years. Date for the tour is set for September 9. Next planning meeting is Wednesday, March 21 @ Tom Campbell’s. for the AGM, including DNR leases, Harbor Patrol, solicitation for volunteers for the tour; Soundkeepers, Bridge (WA DOT). Sarah Morlidge will talk about communications. Treasurer’s Report: Tom Hesselbrock (Treasurer) distributed and discussed the monthly financial report. It shows that we are in good shape prior to anticipated spending for the tour. Legislative/City Light:Peter Erickson (member) reported that last October, he gave them an estimate of $4 million for 400 houseboats. City has access to sources of low interest loans but hasn’t done much since then. History & Archiving: Susan Susor (member) has started going through the historical material and found out that Marilyn Robertson has been talking to the UW and MOHAI about it. Karen Mooney suggested that Dave Galven might be a good person to help with this stuff; he’s been living on a floating home for many years. Communications: Sarah Morlidge (chair) reported that Google Analytics is set up on the website. It shows 205 unique users in one week. She also discussed other metrics regarding e-Alerts: a pretty high number of people open the messages. Membership Development: Sarah Morlidge (member) received the float numbers and KCA numbers and parcel numbers from the City; the City is not updating the ownership info. So Sarah plans to cross-reference that info with info that Jann McFarland and Sarah have been updating. Miscellaneous: Got an e-mail from Dixie Pinkler about a plaque to put on a tree in Terry Pettus park. The Ducks:Blair Robbins said that after the Ducks were approved, they had three years to construct and haven’t started construction. Oil Spill on Portage Bay: Susan Susor reported that the UW was fueling a boat and the pipe broke. There was a fuel spill of approximately 100-150 gallons, which affected their dock. There is a protocol that involves standby people watching and a spill response; if not in place, they get fined. If there is a slow response, the Soundkeepers can be called in to document. Meeting adjourned at approximately 8: 47 p.m. Next meeting on Wednesday, April 4 at Janet Williams’s house. Meeting called to order at approximately 7:10 p.m.
2. Treasurer’s Report: Tom Hesselbrock (Treasurer) reported on the final 2017 report and there are no issues. Tom also requested that the board pass a resolution to close an account that had been used to process credit card payments for Houseboatique, since we no longer use it. m/s/p. 3. Follow-up from Derrick Toba of DNR: Derrick is eager to have a roll-out at the annual meeting, and to be in a position by July 1 to roll out new agreements. John Leness (President) and Amalia Walton (former President and current lobbyist) have discussed choosing a test dock and putting it through the process to test everything. Derrick will attend the March board meeting, to walk us through the lease process. 4. Portage Bay Park: Tom Campbell (Chair, Community Building and Events) asked David Graves at the City who thinks that it will break ground in the spring (likely April). Susan Susor (board member and resident of the University Dock) mentioned that her dock will have their annual meeting with the UW in March; the dock tenants are in discussion with Amalia Walton. Annual Meeting and Tour: John Leness can arrange rental from the Lake Washington Rowing Club. We will aim for Wednesday, April 18. Tour: Tom Campbell circulated a document memorializing the kick-off meeting, held on January 17. Next planning meeting is Thursday, February 22 @ Susan Susor’s. 6. Membership Recruitment: Sue Jostrom (Vice-President) was not present, but some discussion about potential new board members took place. 7. City Light: Peter Erickson (Chair, Legislative Committee) discussed the possibility of inviting the City to our March meeting. 8. Safety and Security: Bill Albert has resigned from the board but John Leness and Bill are willing to continue to go to Harbor Patrol meetings. Maggie Chon (Secretary and member, Safety and Security committee) would like to focus on emergency preparedness in her last year on the board and the committee. Meeting adjourned at approximately 8:52 p.m. Next meeting on March 7 at Susan Susor’s house. John Leness (President) introduced Derrick, who has been working with John and Amalia Walton (former President and current lobbyist) to revise the standardized lease. Tara Wilson has been working with the group. Derrick is the assistant district manager for the Shoreline district – his district does all the leasing and use agreements – it also hs statewide programs, including policy and legislative. Derrick’s staff does all of the lease agreements. For a long time, Lake Union and Portage Bay was under a single land manager. For workload reasons, they recently split it up. Portage Bay and the north part of the lake were assigned to a separate land manager – Jordana Black. Tara Wilson is still the manager for Lake Union. Kaylen Neeler is the land manager for Portage Bay. He went through a PowerPoint to explain the background and context of DNR’s legislative mandate, its mission, and its current approaches. After the presentation, John Leness stated that the next step is rolling out the specifics of what the one size fits all lease looks like at the annual meeting. Once it is ready, the plan is to bring Amalia Walton and Derrick back on board to explain the process. 2. Approval of the December minutes delayed until next month. Next month, Tom hopes to have a final 2017 report and close out the budget. As soon as we have all our records, we will do our tax return. We also need to renew our non-profit status. Blair Robbins (Houseboatique) had an additional Houseboatique day in December and so we are on par with last year in sales. Talks have started with Erik Johnson as to how to make the cottage more like a store when there are sales days. We will have a pop-up store at the annual meeting and the tour. Tom Campbell (Chair, Community Building and Events) brought a tour binder from the last tour. There are 10-11 committee positions, based on past tours; these are sponsorship, general logistics, social media, PR, home selection, brochure layout, photographer, volunteer coordinator, Brown Paper tickets, finance, and billing. The biggest issue is finding homes. This year, the tour will focus on North Westlake. Peter Erickson discussed the possibility of inviting the City to our March meeting. Meeting adjourned at approximately 8:52 p.m.
Next meeting on February 7 at Erik Johnson’s house. 1. Approval of the November minutes and abridged November minutes: (m/s/p: approved) Both full and abridged versions were approved. Tom Hesselbrock (Treasurer) circulated minutes of the Finance Committee meeting. He then reviewed the financial results for 2017. He then discussed the proposed budget for 2018, reviewing those items that were different from 2017. The board discussed membership numbers for 2017. After discussion, the proposed 2018 budget was approved (m/s/p). Blair Robbins reported the results of the holiday houseboatique sale. She reported that she planned to hold another sale day on the 16th of December. John, Blair and Erik agreed to meet to discuss how best to use the cottage to merchandise items for sale. Sue Jostrom (Vice President) discussed the final committee assignments and thanked those who had gotten their charters back to her. The Board then discussed recruiting needs to fill expected vacancies. The Board then discussed ideas for involvement with other community organizations. Tom Campbell agreed to circulate a few ideas. Meeting adjourned at approximately 8:10 p.m.
Meeting called to order at approximately 7:08 p.m.
1. Discussion with City Council candidate Pat Marukami: Peter Erickson (Legislative Committee member) summarized Pat’s responses to our questionnaire, and then she conducted a Q & A with the board. 2. Approval of the October minutes and abridged October minutes: (m/s/p: approved) Both full and abridged versions were approved. Tom Hesselbrock (Treasurer) distributed the current balance sheet. He next passed around a budget worksheet and pointed out that not much had changed since our last meeting. He also is trying to schedule a budget committee meeting soon, before the next board meeting. a. Committee charters: Sue Jostrom (Vice President) followed up on last month’s discussion. All charters are updated. a. Houseboatique: Blair plans to hold Houseboatique on Sunday, December 3. She ordered a small amount of new products. These include: soup mugs, compression bags, flip calendasr for desks with photos of tiles in the public park, and aprons. Next year’s new items: microfiber cleaners for glasses or computer screens. b. Environmental: Dave Chappelle (Environmental Committee chair) reported on the SoundKeepers gala was fun and gave an extended report on the activities of the SoundKeepers this year. c. Legislative: John Leness (Legislative Committee chair) stated that nothing has been happening; still waiting for DNR to come back. City Light issue is still pending. d. Communications: Sarah Morlidge (Communications Committee chair) reported that there was an e-mail from a student in Japan who is studying floating home construction. Sarah was also contacted by a company that provides diving services to floating home members. e. Miscellaneous: Charging station discussion. Approval of the August minutes and abridged August minutes: (m/s/p: approved) Both full and abridged versions were approved. Introduction of Karen Mooney: Tom Hesselbrock introduced our incoming Treasurer (beginning in April). Tom Hesselbrock (Treasurer) distributed the current balance sheet, which shows we’re in pretty good shape. Tonight starts our budget cycle for 2018. The suggested 2018 budget was distributed and discussed. After the November meeting, the finance committee meets before December meeting to finalize a budget for final approval by the board in December. Tom highlighted the things that he anticipates will be different next year, for example, the tour. Committee Assignments – Sue Jostrom (Vice President) distributed the current charters to give to committee chairs to double check, and return to her. Environmental and other committee chair replacements – Sue Jostrom announced that Dave Chappelle will be leaving the board so we will need an environmental committee chair. Terms that are over are in April include: Tom H., Dave Chappelle, and Sue Jostrom. The board discussed reviving the Membership committee. Karen Mooney volunteered to be on that committee. FHA maintenance person: The board discussed possible options. EAlerts: Sarah Morlidge (Chair, Communications Committee) will change the “From” so that the sender will say “Floating Homes” and hopefully more people will read the alerts. We have an average of 40% of people who will open the message, which is pretty good. Docktoberfest: Tom Campbell (Chair, Committee Building and Events Committee) reported that this annual event was successful. Soundkeepers: Dave Chappelle (Chair, Environmental Committee) mentioned that the Salute for the Sound Gala is coming up on October 28 5:30-9:30 at the Seattle Design Center. DNR Lease Update: John Leness (President) updated this issue. He has been working with Amalia Walton (former FHA President and current lobbyist) to review the DNR’s draft model leases. Not much progress was made over the summer because DNR staff were fighting fires. Charging Station: The City put a stop work order on the charging station near the FHA Office. Box of Records: Someone sent John a request for a place to store boxes of records that are not currently stored in the cottage. Susan Susor (member, History and Archiving Committee) volunteered to take care of the records, whatever and wherever they are. Cottage: Erik Johnson has been renovating the cottage; deck still needs to be replaced. Other: Joe Inslee (member, Environmental Committee) reported that Portage Bay Park now scheduled for completion in 2018. Electrical Upgrade: Peter Erickson (Member, Legislative Committee) mentioned that City Light needs to know approximately how many floating homeowners will need an upgrade. Several board members volunteered to make an informal count. Next tour date: September 9, 2018. Tour committee starts meeting in January monthly. This year, Tom Campbell (Chair, Community Building and Events Committee) is planning to have it on North Westlake, under the Fremont bridge and possibly Northlake. The bridge tender’s tour could feature the Fremont Bridge. Meeting adjourned at approximately 8:36 p.m. Next meeting on November 1 at Blair Robbins’s house. Approval of the June minutes and abridged June minutes: (m/s/p: approved) Both full and abridged versions were approved. Tom Hesselbrock (Treasurer) distributed the current balance sheet. Ride the Ducks: Update on site. New news: Someone purchased a decommissioned ferry Hayu to turn into a nightclub; it is currently moored near the southernmost dock of the Log Foundation. According to land use folks, it can’t operate a night club while moored there but can load passengers and drive around the lake. DNR Update: Our lobbyist Amalia Walton and John had another meeting with DNR on Wednesday, June 28; it was a page by page flip-through. We are currently waiting for the document back from the DNR. Electricity: Peter Erickson (member, Legislative) had a good discussion with City Light; unfortunately, they want to impose a $10K charge per houseboat. The City has still not finalized what they want from a code standpoint. Cottage: Tom noticed a stop work order at the charging station. DCI: The City sent out notices alerting houseboat owners to the new Tip, 209A effective May. Sarah will put out a notice with some language from John (we got 60 percent of what we asked for during negotiations over the overly broad language and enforcement of previous Tip 209). Aurora Bridge painting: Dave Chappelle (Chair, Environmental) reported that after community input, phase II will look very different from phase I. The community feels like they’re being listened to this time. 520 Bridge: Joe Inslee (member, Environmental) mentioned that the big issue is the Montlake Market. May be going to court. Events: Tom Campbell (Chair, Community Building and Events) announced a date (Thursday, September 28@6) for Docktoberfest at Center for Wooden Boats. Other: A boating-related death on the lake on Sunday was reported. A reminder that if we hear something, we should let Harbor Patrol know about it. Meeting adjourned at approximately 8:24 p.m. Next meeting on October 4 at Maggie’s house. Approval of the May minutes and abridged May minutes: (m/s/p: approved) Both full and abridged versions were approved. Financial Report:Tom Hesselbrock (Treasurer) gave a financial report. Committees:John Leness (President) announced that Tom Campbell (new FHA board member) has agreed to chair the social committee (official name: Community Building and Events). Sarah Morlidge (chair, communications committee) added the new board members to Dropbox, so they can access files including committee charters. Lake Union Association Meeting:Janet Williams (new board member) attended the last meeting where they talked about several waterways. Waterway 22 ends at Stone Way and has a deteriorating bulkhead, which will need to be repaired. Bill Albert (chair, safety and security committee) is most concerned about Waterway 20, which is the debris pen. Left hand turn onto Fuhrman going north on Eastlake: John Leness asked Ann Preznya (ECC President and floating homes owner) if she has any information about this issue. Apparently the City is still considering eliminating the left turn going north as part of the plan to re-do the transit corridor along Eastlake/Roosevelt. The back up at rush-hour means that the bridge can’t go up. DNR Update: Amalia Walton (past President and current legal representative) and John are scheduled to meet with DNR on Wednesday, June 28; if anyone wants to sit in, it’s a page by page flip-through. DCI: We have had an issue with Tip 209A. The City is now acknowledging that repairs do not need a permit exemption. John Leness passed out a new document and pointed out the revisions/exemptions from permit requirements, including siding, roofing, doors, or windows. This revised tip was issued in April 2017 and is effective now. John Leness stated that DNR is in the process of writing a single master document that governs everyone who has aquatic land leases. The other main outstanding legislative issue is with City Light, which Peter (not present tonight) is tracking. Aurora Bridge painting held last night meeting last night. There is a general public meeting next Tuesday night – three hour meet and greet. Joe Inslee updated info on Portage Bay Park. The construction dates on the website are May 2017-2018. He also reported on the Puget Soundkeepers Sweep dates (June 17 = arboretum; July 5 = fireworks cleanups; August 5 = Salmon Bay). FHA Office Renovation: The board discussed a possible work party for the deck. Houseboatique: Blair is selling canvas bags with the FHA logo! Other: Sarah Morlidge said that Amy Woods is collecting info on peoples’ rules and regulations on houseboats (condos, coops, leased). Board discussed that in the old days, there used to be dock captains, and we need to update this information. Sarah would like this information documented and on a spreadsheet, and would be able to convey the info to other people on the dock. Meeting adjourned at approximately 8:06 p.m.
Next meeting in July at Peter Erickson’s, Wednesday, July 19. Approval of the April minutes and abridged April minutes: (m/s/p: approved) Both full and abridged versions were approved. Annual Meeting – The board debriefed the meeting. Election of Treasurer – Officers are elected at the annual meeting, but the board elects the Treasurer. Tom Hesselbrock agreed to stand (m/s/p: Tom elected as Treasurer for another year). Financial Reports – Tom Hesselbrock stated that there are few changes from last month except for net income (now in the minus) with anticipated expenses. If someone not on the board wants more info, they can contact Tom H.
Committees – John Leness (President) passed around a sheet with proposed committee members. He went over the possible committee assignments and asked board members to get back to him when they decide where they’d like to volunteer. Susan Jostrom (Vice-President and outgoing chair, Community Building and Events) emphasized the importance of identifying those who would like to take the lead on the next tour (2019). Cottage – Erik Johnson is not present; discussion postponed. The thought is to get a work party together to finish the exterior sometime this summer. Aurora Bridge and other Environmental Issues: Dave Chappelle (chair, Environmental Committee) thinks this will probably be a multi-year issue. Also the sewage outfall, e.g., from West Point, may also be something that we decide we want to invest more time in. 520 Construction: The City (?) denied the sound variance. Courtney Cooper passed around a recent decision. John suggested getting a copy to Sarah Morlidge (chair, Communications Committee) to put it on the website. Reconnecting Electrical: Peter Erickson (member, Legislative Committee) mentioned that a neighbor has approached him with a reconnect issue. SCL now requires each house on a dock has to have a meter attached. John and Peter have met with SCL to let them know that it was not going to work, conceding that the electrical on many docks needs to be upgraded. SCL realizes that financing would be a hurdle so that the upgrade can become affordable for docks. Goal is to have each dock to make the transition within five years. DNR leases: John reported that discussions are on-going. Tara Wilson only has responsibility for Lake Union now; separate person for Portage Bay and Lake Washington. Discussion with DNR to be continued. University Dock: Susan Susor (member, Community Building and Events) reported that their dock met with the university just this week, which they do each year because it’s annual. The lease with the UW will be up in seven years. Susan also mentioned that until construction begins on Portage Bay Park, the City plans to use the old police station as a men’s homeless shelter (80-100 men). Probably missed the time on starting the park this year; Joe will look into timeline. Left hand turn: Margaret Chon (Secretary) raised the issue of the left turn northbound on Eastlake before the University Bridge. No information on whether it’s slated for elimination as part of the Roosevelt high speed transit corridor plan. Meeting adjourned at approximately 8:07 p.m. Next meeting on June 7 at Tom Hesselbrock’s. Introduction of Potential New Board Members: Board members went around the room to introduce themselves. Introduction of three potential new board members. Approval of the March minutes and abridged March minutes: (m/s/p) the full and abridged versions were approved. Financial Reports: Tom Hesselbrock (Treasurer) presented the finances and noted that for this time of year, we are in very good shape. Safety and Security: Bill Albert (chair, Safety and Security) reported that the Wallingford Community Center wants to have a place to hand launch boats; this will impact the holding tank for Harbor Patrol greatly. The holding tank holds debris picked up from the lake. After discussion, the board’s consensus is to keep an eye on the situation as it develops. Aurora Bridge: Dave Chappelle (chair, Environmental) mentioned that they are cleaning up Phase I and are planning for Phase II. Dave has contacted SoundKeepers and the City, and had a good discussion with both groups. Dave’s thought for the annual meeting is that SoundKeepers would announce the dates for the sweeps, talk about the Aurora Bridge, take questions and answers, and do a tabling event. The board agreed. Legislative: John Leness (President and chair, Legislative) reported that had and Amalia Walton (former President and current FHA lawyer/lobbyist) met with the DNR a couple of weeks ago to go over the leases on a line by line basis—a flip-through. DNR is in a complicated situation in that they tried to revise their lease form a few years ago and the effort just died. Ride the Ducks: John and others reported that a big barge came and left; it removed one of the two pilings; someone apparently realized that they need the other piling to tie the barge too. They also removed the log raft coming out from Terry Pettus area. The construction window closes on April 15, so they won’t be able to do any more work until October. John summarized the history of the litigation and settlement: no queuing on Fairview; if queue, have to queue on their property, not on the ramp; their route has to be toward downtown; have to relocate speakers down low; and keep sound at a certain volume. Houseboatique: Blair showed the water proof pocket with an adjustable strap that you can put around your neck and through which you can operate your phone. One free to each household member attending the meeting. Bill showed a reflective address plate that he got for his dock from Fast Signs. This is for purposes of easier location by Harbor Patrol in case of emergency. Community Building and Events: With Sue Jostrom stepping off to be VP, a new chair is needed to step in as chair of this committee. Sue summarized past events and activities: we have done monthly music jam; supported Seattle Night Out; Docktoberfest; the Tour (biennial). She thinks the door is so wide open as to what kinds of things could be started and done. Meeting adjourned at approximately 8:25 p.m.
Next meeting on May 3 at Dave’s Chappelle’s. Tom Hesselbrock (Treasurer) reported that finances are in good shape overall. a. The board discussed details of the upcoming FHA members’ meeting on April 19 and made suggestions for format this year. b. The board also discussed that Libby Kutcipal (Vice-President) and Joyce Black are leaving the board. Courtney Cooper and Ranaan Schnitzer are willing to join. The history of board membership was reviewed, including the board’s geographical diversity policy adopted last year. Dave Chappelle mentioned Janet Williams from Westlake, who indicated her willingness to be a new board member. c. Sue Jostrom agreed to stand for Vice President. Charging Station: John Leness met with the concerned parties and will draft an agreement that reflects their discussion. The charging spot will be technically on city property but will be private. The FHA member who installed the station is willing to share it with others if they split the cost. b. Houseboatique: The board authorized Blair Robbins (chair, Houseboatique) to order a water proof pocket with a neck band to give away at the annual meeting. a. Membership: The board revisited the discussion of encouraging docks to enroll with a dock membership. Sarah Morlidge (chair, Communications committee) also reviewed the status of our new on-line membership system. b. Red Robin: A short update was provided by Maggie Chon (secretary) and Bill Albert (chair, Safety and Security committee) on the successful resolution and settlement of the dispute with the developers after a two-year effort. Meeting adjourned at approximately 8:45 p.m.
Next meeting on April 5, 2017. Meeting called to order at approximately 7:10 p.m. In the absence of president John Leness, Libby Kutcipal (Vice President) chaired the meeting. Libby introduced Courtney Cooper as a potential new board member from the Shelby Dock on Portage Bay. 1. Approval of the January minutes: (m/s/p) the full version was approved. Tom Hesselbrock (Treasurer) passed out the 2016 Final Financial Report. Attached to the 2016 final report was the final tour report; this was reported as income in the new year. Tom then distributed the first financial summary for 2017 for review and discussion by the board. 3. Legislative committee: John and Peter Erickson are both out of town, so Libby conducted this discussion. a. Seattle City Light (SCL) Discussion: John and Peter seemed to have had a successful meeting with SCL. b. Meeting with the DNR about leases: John sent around a possible date, which is either the evening of February 22 or during the day on the 23rd. a) Environmental: Dave Chappelle (chair, Environmental) plans to invite Puget Soundkeepers to the FHA annual meeting. Joe Inslee (member, Environmental) suggested that we work with them to have a specific sweep for the floating homes. b) Houseboatique: For the annual meeting, Blair Robbins (chair, Houseboatique) will have a Houseboatique table. c) Safety and Security: Bill Albert (chair, Safety and Security) will invite Harbor Patrol to the annual meeting. d) Events: The date of the annual meeting is Wednesday, April 19. Sue Jostrom (chair, Community Building and Events) would appreciate some ideas about the meeting. e) Board Development and Operations: Courtney and Ranaan (who came to the last meeting) are new board members whose names will be put forward before the annual meeting. Libby’s term will end and so the board will need to identify a VP. 5. Membership: Jann McFarland (FHA office manager) sent Libby a summary re: group (dock) memberships. The board thought that the summary circulated was a good start to addressing this issue, but wanted both Jann and Sarah to be at a meeting to develop a concrete plan. 6. Red Robin: Maggie Chon (Secretary) reported that the neighbors filed a notice of appeal, and the developer contacted them shortly thereafter. Settlement discussions are proceeding. 7. Electrical car charge update: No resolution was reached on this issue. Board decided to ask John to contact involved parties to discuss. Next meeting on March 1, 2017 at Susan Susor’s (1409 Boat St. # 5). Meeting called to order at approximately 7:16 p.m.
John Leness (President) was acting secretary as Maggie Chon (Secretary) was out of town. Libby Kutcipal (Vice President) introduced Ranaan Schnitzer as a potential new board member from Joyce Black’s dock on Portage Bay. 1. Approval of the December minutes: (m/s/p) both the full and abridged versions were approved. Tom Hesselbrock (Treasurer) reviewed the financials, reporting that we were on track against budget for the beginning of the year. a. Power cutoff: Peter Erickson (member, Legislative Committee) reminded the board of the concern about City Light’s new policy regarding power reconnections. He reported that he and John were waiting for a meeting with City Light to discuss this issue. b. DNR: John Leness asked those board members who were interested in participating in the meeting with DNR to discuss their new lease form to let him know. He reported DNR’s proposed meeting dates. a) Board Development and Operations: Libby reported that Courtney Cooper had expressed her interest in joining the board. All agreed that she should be invited to the February meeting. b) Events: Sue Jostrom (chair, Community Building and Events) reported proposed dates in April for the Annual Meeting. a) Filming. Blair Robbins (chair, Houseboatique) described her work assisting a Korean film crew working on her dock. b) Electric Boats. 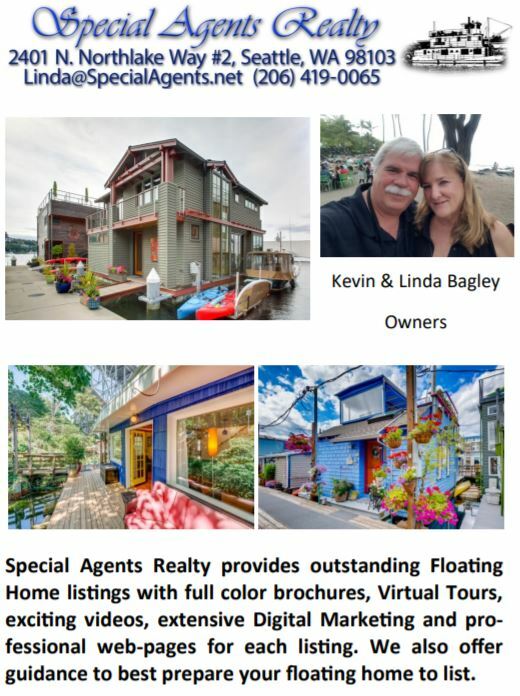 Mike Dellario (member, Communications) raised the possibility of organizing the many electric boats owned by floating home owners, forming a club, and entering them in the Opening Day boat parade, as a way of publicizing the FHA. He circulated several sample burgee designs. The board asked that all who were interested contact Mike. c) Meeting with Hilary Franz: Amalia Walton then joined the meeting. She reported that she had met with Hilary Franz, the newly elected head of DNR, to discuss issues relevant to FHA members. At the conclusion of her report, Amalia left the meeting. d) Membership: Sarah Morlidge (chair, Communications) distributed a spreadsheet showing current membership, and asked the board to help her gather missing information. e) John then reported on the status of the private EV charging station at the cottage. f) Sue then reported that Seattle Public Utilities had been extremely responsive regarding the used car dealership as it was washing cars. Meeting called to order at approximately 7:15 p.m.
2. Treasurer’s Report: Tom Hesselbrock (Treasurer and Finance Committee member) announced that he received a letter from our lawyer Peter Eglick, raising his rate as of January 2017, after many years at the same rate. The board agreed that the increased rate is still reasonable. Tom also discussed the Annual Financial Report as of the end of November. Tom raised the question of whether we should recruit someone to do dock membership for next year. For our next meeting, it was suggested that we could have a map print-out to see which docks are currently members. The board also agreed that we should we discuss then the question of designating a person to make a membership push. Billings should be going out in December/January, and many docks have their annual dock meetings during this period as well. Tom then distributed the 2017 Budget Worksheet, as a recommendation from the Finance Committee to the board. Approval of the 2107 Budget: m/s/p. 3. Houseboatique: Blair Robbins (Chair, Houseboatique) reported that the holiday sale went well this year – we made about $1200 after expenses. Judy Sarafin (former FHA board member) stepped in for the whole day, and the office was a warm and welcoming space thanks to Erik’s renovations. a. DNR: John Leness (President and chair, Legislative Committee) received a letter from DNR re: a new standard lease form. DNR usually gives FHA owners a chance to review the standard form for leases on the lake. January to-do: Might be good to have a small group of non-board members to review this. b. City Light has a new policy. Peter Erickson (member, Legislative Committee) reported that if anyone needs to disconnect power for any reason, then in order to get reconnected, one must pour concrete on the shore, and run a rigid conduit under the dock to your house. The board greed that the FHA should negotiate with City Light. c. NOVs: Our lobbyist Amalia Walton (past FHA president) has been talking to DCI about a potential Director’s Ruling on repairs. This year, we didn’t have a rash of NOVs. pen may be replaced by a community boat launch area. The board generally agreed to keep monitoring this issue. Dave Chappelle (chair, Environmental Committee) reported that the Soundkeepers just settled a lawsuit with the City of Tacoma; Tacoma will have an industrial waste treatment area. They sued under the Clean Water Act and as part of the settlement, they received $70K to be used as they see fit for other conservation issues. Dave also reported that Soundkeepers has a weekly sweep of Lake Union every Friday; NWOC volunteers kayaks. Average about 5 pounds each kayak. At the end of the year, will have pulled 20K pounds out of the lake. The board had a lively discussion about specific communications tools and linking strategy to a membership drive, including sending a postcard to new houseboat owners. Ideas suggested included a blog spot on the website; a hashtag for people to post photos to the Instagram account. The board discussion revolved about what (from a social media perspective) would be attractive to our newer members. She would also like to have a space on the website to join our mailing list form on the website. Tom made a pitch for board recruitment for 2017; terms for 2 current members will end. Tom also mentioned that the electric docking station is installed; John agreed to talk to this neighbor. Erik mentioned that a couple of people have looked at the tree near the FHA Office, and it is falling into the lake. The board agreed that we would call the City Arborist to take a look at it. Meeting adjourned at approximately 9:05 p.m.
2. Treasurer’s Report: Tom Hesselbrock (Treasurer and member of the Finance Committee) circulated the Annual Financial Report and Tour Statement. Because of the successful tour, we are going to make $41,700 over against a budget of $21,500. This is much more than 2014, even before we collect the final $5000 in sponsors. Tom also circulated a proposed 2017 budget, and explained his proposed changes for next year. The final draft will be presented for board approval at the December meeting. a. John Leness (President and chair of the Legislative Committee) stated Amalia Walton (our board designated lobbyist) has forwarded our proposed repair language to DCI but has not heard from them yet. b. On the raft issue, Ann Preznya from Fairview has requested a meeting with the Mayor, and asked us to attend. a. Cycle Track: Dave Chappelle (chair of the Environmental committee) mentioned the issue of black tacks sprinkled across the track. The track is busy even though it’s new. Dave thinks it is working well and is being received well along the corridor. Dave had a chance to go to the opening, and thanked the city for allowing us to be at the table. The opening was attended by the Mayor, Mike McGuinn and Scott Kubly. b. Puget Soundkeepers Annual Auction: This year, the auction is on Saturday, October 22 at 5:30. We agreed to sponsor a table as in past years. 5. Community Outreach: Docktoberfest cards have been put at the heads of each dock except north of Portage Bay. a. Budget: Mike Dellario (member, Communications Committee) reported that the budget is half of what it was last year. Sarah Morlidge (chair, Communications, Committee) prepared a budget and gave it to the finance committee and said that it was all she needed. b. Emergency Alerts: Joe Inslee (member, Communications committee) is working on emergency alerts with Sarah. c. Board Meeting Minutes: Maggie Chon (Secretary) takes minutes, which are detailed notes, for the board; has them approved by the board. The board agreed that abridged minutes will be posted on the FHA website after board approval. 7. Houseboatique: Blair Robbins (chair, Houseboatique) reported that we made $1000 at the tour, including from some of our “classic” stuff (the cookbooks and sweatshirts). The holiday sale will be the week after Thanksgiving week: Sunday, December 4th. 8. FHA Office: Erik Johnson has been renovating the interior of the Bill Keasler Cottage on Fairview. The 2017 budget will include the deck repair. 9. Other Committee Reports: No other formal reports delivered. Meeting adjourned at approximately 8:30 p.m.
Meeting called to order at approximately 7:12 p.m.
2. Tour: Sue Jostrom (chair, Community Building and Events Committee and tour director) reported that the tour sold out a couple of days after the Pacific Northwest magazine article came out. She also mentioned an October 28 event: the fourth annual Docktoberfest (6:30-9 p.m. at the CWB). 3. Treasurer’s Report: Tom Hesselbrock (FHA Treasurer and member of the Finance Committee) passed around the balance sheet as of 8/31/16. 4. Legislative: John Leness (President and chair of the Legislative Committee) stated that Amalia Walton (past president of the FHA and now an attorney with Miller, Nash, Graham & Dunn) is helping us to negotiate with DCI with regard to proposed language as to what repairs would require permits and what would not. 5. Seattle Met Magazine: We received a ping about someone who has done some renovation recently and would like an article on it. Blair Robbins (chair of Houseboatique) volunteered. 6. Tenas Chuck electrical charging station: Some folks approached the FHA; they would like to install an electrical charging station behind the FHA office in exchange for paying our electrical bills. The board agreed that if they paid for the electricity, they could install the station. The charging station should not be connected to our FHA office. 7. Grand Opening for the Cycle Track: Dave Chappelle (chair of the Environmental Committee) mentioned that the opening is on September 15th. The board agreed to send a representative. 8. Communications Strategy Budget: Sarah Morlidge (chair of the communications committee) will put something together for us to discuss at the next meeting. a. Safety and Security: Police and fire department discussion about one station is no longer on the table. b. Budget: Tom Hesselbrock (Treasurer and member of the budget and finance committee) stated that it’s budget time for next year. At the next board meeting, Tom will hand out budget reports to discuss. Our November meeting will be a discussion of any changes. In December’s meeting, the board will approve it.